“Saison brewed and dry hopped with 100% Nelson Sauvin hops. Fermented in oak foudres with brettanomyces and bottle conditioned for natural carbonation. As we bumble along through this crazy maze of life, it’s a wonder the plaes we can uncover inspiration. 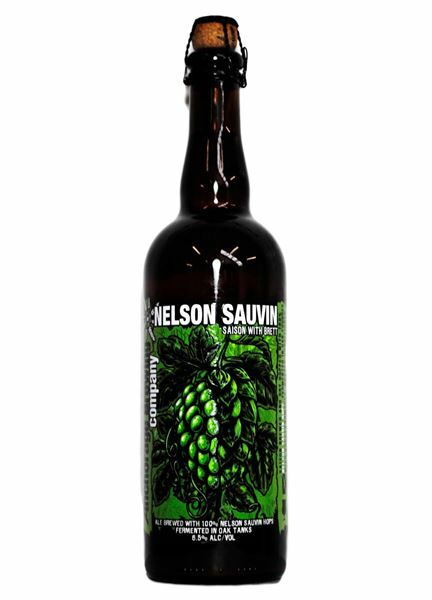 The Nelson Sauvin muse came knocking on my soul-searching door recently, bringing with it the nonchalant, cool factor that it embodies. Its character carries with it such organic wisdom and ease of being. Although Nelson shoulders a polarizing personality, with it’s overwhelming juicy bouquet and spouts of spicy black pepper, it embraces all that it is, and hums a little mantra reminding us that what other people think of us, is really none of our concern. This beauty of a hop is not here to stir up trouble. Nelson plays nicely with the fruity saison yeast, and has a nice light-hearted banter with it buddy, Brett. This botanical hop goodness is her to shine it’s tangering, gooseberry zest, explore the boundaries of wine meets beer, and see where the relationship goes. This hop soul is simply here to let his own unique character settle in for itself, offering us the space to sit back, enjoy a taste and do the same.